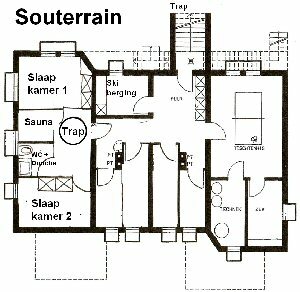 The holiday home has 3 bedrooms, one on the ground floor and the other two one storey lower, to be reached with a spiral staircase. The two bedrooms downstairs have three beds, a big wardrobe and a small televisons each. Each bedroom has one raised bed. 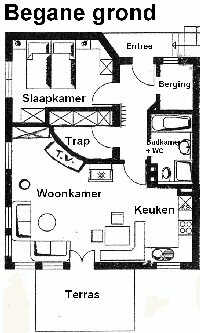 The television in the living room offers a number of Dutch broadcasting stations! As from October 2001 you can also enjoy the sauna. The basement has, in addition to the 2 bedrooms and sauna, a small hall with a park bench, a private toilet with shower, equipped with separate water heater. Behind the stairs is the door to the common utility room where skis, snowboards, shoes, etc. can dry and, where appropriate, can be prepared (there is a special worktable). There you can also play table tennis (bring your own bats and balls). On the first floor (ground floor) you will find, next to a large bedroom with two connected beds, a luxurious bathroom (bath and toilet). A washing machine is present in the bath room provided with a special dry setting: so no suitcase full with dirty laundry. All your laundry is clean very soon and also a drying-frame is present (that you can fix to the spiral staircase). The living room has a modern open kitchen with an enjoyable typical Austrian dining area. The parquet floor is polished and everyone is asked not to enter the living room with outdoor shoes. Next to a lot of heat, the fireplace offers you the fine sense of security; on cold or wet days the fireplace provides a cozy atmosphere. The living room has a large round couch, a coffee table and a comfortable armchair with a side table. As from here you will be involved with everything that takes place in the living room and dining area. Of course, there is TV (with satellite connection) and audio equipment. You can play your video-tapes and DVD’s. Two French doors provide access to the terrace facing South with views to the mountains (skiers look like aunts coming down!). The balcony of the neighbors provide shadow on warm summer days. You can find the terrace furniture in the storage room next to the front door. The kitchen is equipped with an induction hot plate, microwave, dishwasher, electric kettle, fridge with small freezer, coffee machine, toaster and hot air oven. Please bring your own sets of sheets, towels, tea towels, laundry detergents and, as the case may be, fire wood, chocolate sprinkles and peanut butter and of course a good mood and a little bit of sunshine!